Preheat the oven to 425°. In a spice grinder, combine the coriander seeds, mustard seeds and crushed red pepper and pulse until coarsely ground. 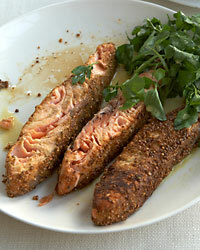 Season the salmon with salt and pepper, brush with 1 tablespoon of the Dijon mustard and coat with the ground spices. In a large, ovenproof, nonstick skillet, heat 1 teaspoon of the olive oil. Add the salmon, coated side down, and cook over high heat until lightly browned, 2 to 3 minutes. Carefully flip the salmon. Transfer the skillet to the oven and roast the salmon for about 6 minutes, or until just cooked through. Transfer the salmon to a cutting board. In a medium bowl, whisk the lemon juice with the remaining 1 tablespoon of olive oil and 1/2 teaspoon of Dijon mustard. Add the watercress and parsley, season with salt and pepper and toss to coat. Cut the salmon into 6 pieces, transfer to plates and serve the salad alongside.